One thought that kept crossing my mind during my viewing of Proper Binge is just how much the film nails the modern small town vibe and the bleak nature of it’s inhabitants. While the movie is set in Alaska, the aura of the location feels universal for just about any rural area whether it be the midwest, northeast, the south, etc. It is through it’s setting, stunning cinematography, and real characters that Proper Binge thrives. However, it does fall short when it comes to the execution of the story. 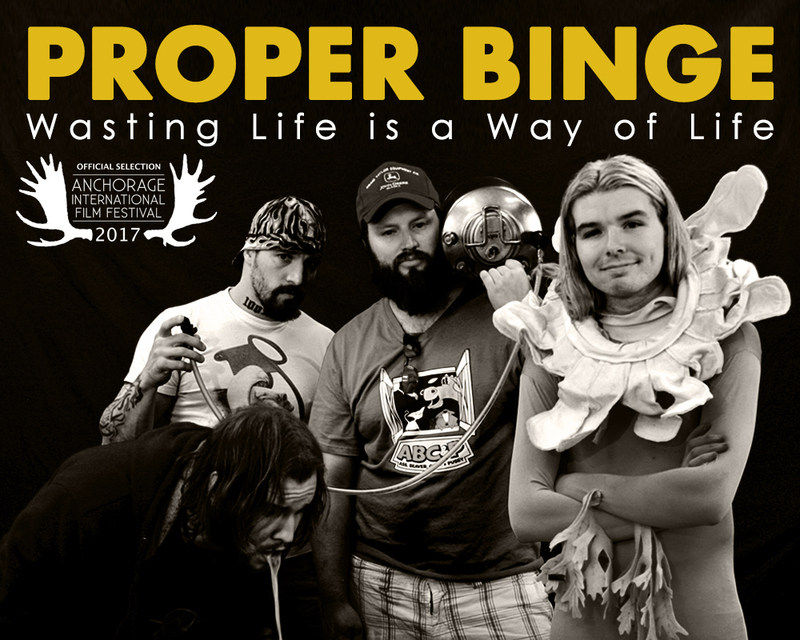 Proper Binge revolves around Burgess “Buzz” Zwink, an early 30’s somebody in a small Alaskan town who squanders his life away boozing at the bars with his friends. Buzz is tasked to apologize to three people he has harmed for the purpose of a court ordered substance abuse program. Since Buzz has been in trouble with alcohol so many times before, his counselor orders him to film his apologies as opposed to writing them out. It is in this plot line that lies the main problem I had with the film; Buzz filming his confessions is only a fraction of the actual story yet it is set up as if it will be a vital part of his arc. In all actuality, that subplot gets completely lost in far more interesting progressions of the story; Buzz’s day drinking with his friends, Buzz running a man over with a car while intoxicated, Buzz realizing who he ran over, Buzz befriending a homeless man who almost operates as a Ghost of Christmas Future if anything, and so on. It takes a plethora of boozey events to occur before Buzz ever picks up the camera and makes any sort of apology. I found that plot line to be distracting when it made its way back into the film. The movie is genuinely interesting without that already established arc; it is as though you've just dropped in on a day in the life of a couple of heavy Alaskan drinkers. 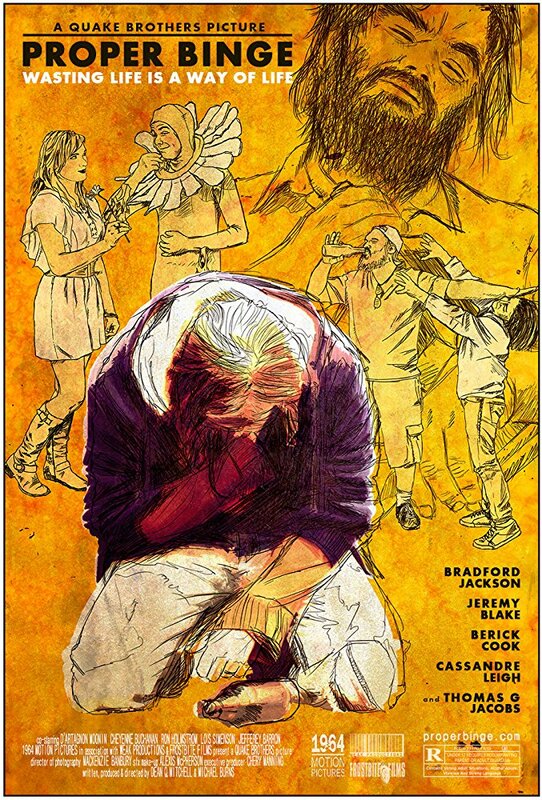 In that respect, it reminded me a lot of movies like Clerks or Dazed and Confused where there isn't necessarily a story so much as it is just a time, a place, and a few entertaining characters that make the movie. Proper Binge is almost completely in that realm only it is slightly hindered by that rather heavy-handed plot line in the end. The casting of Proper Binge is fantastic. Every character feels raw to their environment and completely believable in their roles. Bradford James Jackson gives a near perfect performance in the titular role. He works most effectively in Buzz’s more subtle moments as you root both for and against him. His is a rather somber story that does feel as if it is biographical to the writers/directors. On a technical aspect, I cannot speak highly enough about just how beautifully this film was shot. The cinematography is exquisite with every shot being polished and effective. Having it shot in black and white is the perfect accent to the film’s bleak characters and setting. I encourage the team behind Proper Binge to make many more movies as it is apparent there is plenty of talent behind the camera. All in all, Proper Binge is a solid effort. The execution of the plot is a little sloppy at times, but it doesn't prevent the movie from retaining interest. The characters are strong, the performances solid, and the cinematography is stunning. Proper Binge is most certainly worth a watch just as it’s cast and crew are talents worth watching out for.